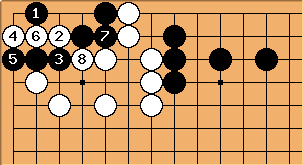 Alex Weldon: This seems to prevent Black from encroaching any further, and I don't see any way to accomplish that in sente. 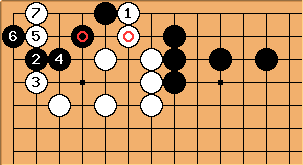 My concern, however, is what happens if Black plays at . If White cuts Black off, could Black then live in the corner? Fletcher: Please note should be at . 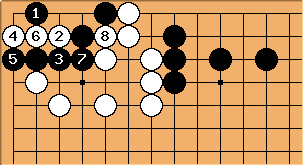 It works out the same in the above diagram, but is obviously better if black plays tenuki or does something silly like trying to live in the corner. This pretty much boils down to variations of the L-group. I'm sure Black can't live. If in the previous diagram at here, then and . and are miai. 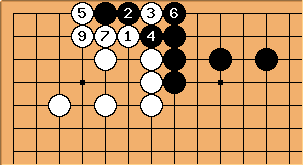 For the record, the explanation why Black dies is given at Rectangular six in the corner. Hyperpapeterie: Do we have a solution?